I have got a photo of the town flag. Its ratio 1:2, colour is light blue and on the center there is the Coat of Arms of the town. The resolution No.30/2004.(V.01.) of the town which renewed the original 9/1997.(V.20.) 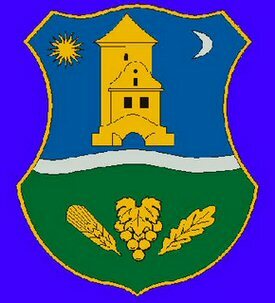 resolution about the flag and the Coat of Arms of the town is at <www.devecser.hu>. The flag is blue (Pantone 277 C), the ratio of the flag: 1:1,5, in the centre there is the Coat of Arms of the town.